To cope with what can be a very traumatic experience it often helps to familiarise with your surroundings. There will be many different people on the ward and knowing what each one does and what they are responsible for can be reassuring. There have been many advances in intensive care treatment in recent years and there are many specialist roles within these units. When you and your baby arrive on the ward, you will be assigned a Primary Nurse. Nurses on NICUs are specially trained and are well qualified and experienced in dealing with all aspects of newborn care. This nurse will be your first point of contact and will be able to coordinate all aspects of your baby`s care; you should not hesitate to ask your Primary Nurse any question in relation to the care and treatment of your baby. Having an assigned nurse provides continuity of care for your baby. It can also be particularly reassuring to parents to have a single and immediate point of contact with one person who understands the background and circumstances of their baby`s condition. The person in overall charge of the ward is called the Charge Nurse or the Nurse Manager; it is their job to ensure that the ward runs smoothly. They will also be highly qualified and experienced in their field and will be able to answer any questions or address any concerns. 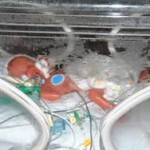 The above nurses will be responsible for the day to day care of your baby during their time in the NICU. However, your baby may also need treatment from specialist Doctors such as a neonatologist or a paediatrician. Caring for small babies is not at all like treating adults and these Doctors specialise in treating babies and newborns. childrens beds and we can`t wait to begin these new chapters in our lives. But, when life throws us a curved ball, it is often the help and care of the specialist Doctors, Nurses and other staff in the NICU that help make those dreams a reality.